I don’t have the words to accurately describe the photo’s sublimity. I suggest you take a minute to view it full screen—and you might be left speechless, too. Here’s a high-resolution shot. Cassini met its end dropping into the ringed planet’s atmosphere on September 15, 2017, after 13 years of Saturn science. Its numerous accomplishments included dropping a probe and discovering liquid methane oceans on Titan and finding plumes on the moon Enceladus. When it finally met its end, it left us emotional. 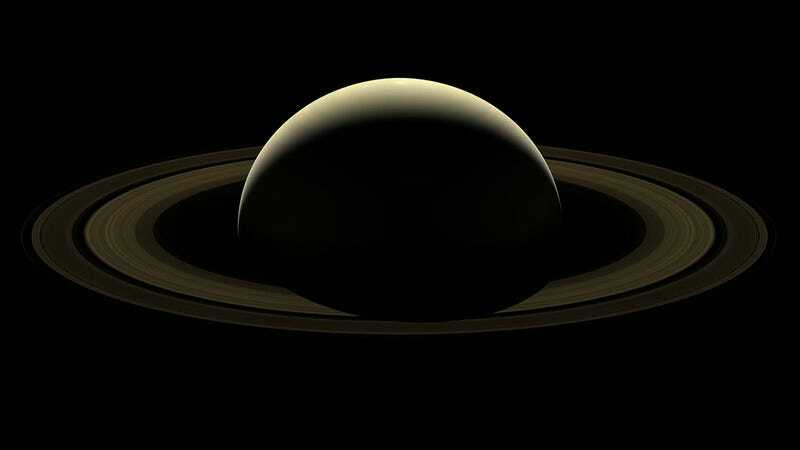 As its swan song, the “Farewell to Saturn” mosaic shows a dramatic image of the planet in shadows like a crescent moon. But zoom in and you can discern the individual rings, strata of hydrogen, helium, and ammonia in its atmosphere, and even six of its moons, including Enceladus. The image consists of 42 images selected from 80 total taken in two hours. It was taken from a distance of 698,000 miles. Use this moment to take in an incredible piece of human accomplishment requiring 260 scientists and countless hours to give us a glimpse at (arguably) the most beautiful of the Solar System’s planets. And finally, with mysteries left unsolved and even the prospects of life, let’s get another spacecraft back to Saturn soon.